Sitges after the storms: contemplating the disappearing sand? Many Catalan beaches are losing their sand. The November storms have starkly revealed this problem and the long term solution is a complex one involving a range of environmental, economic and social issues. The estimated costs of 1.690 million ptas to restore the damaged beaches and promenades are overshadowed by concerns regarding future sustainability, not just of the beaches, but of the coastal fringe in general and the tourist industry in particular. Both money and beach sediment are scarce resources in Catalunya, and conflict between competing resorts all looking to bolster their share of the tourist cake may be difficult to reconcile. Sea levels are rising. Maximum wave heights have been steadily increasing during the last decade, from 8.22 metres in 1991 to 9.92 metres on 9th November 2001. The best defence against coastal erosion and rising sea levels is the humble beach, cheaper than traditional hard defences in both the short and long term. But the creation of sustainable artificial beaches is more complex than simply dumping sand or shingle on the shore and the organisation responsible for these operations estimates annual sand loss at 10% of the amount spread. Beaches act as the natural sustainable defence system against coastal erosion. The secret to their success lies in the fact they can adapt their shape very quickly to changes in wave energy and also dissipate this energy in minor adjustments of the position of each sand or shingle grain. The beach is therefore able to maintain itself in a dynamic equilibrium with its environment due to the mobility of its sediments. The beach tends to adopt different profiles according to the season. Sand lost during winter storms tends to be deposited off shore forming protective submarine banks, to be transported back on to the beach during low-energy summer sea conditions. Material is lost from the beach due to coastal currents (see below), but a constant source of new sediments is normally supplied from river deposition and coastal erosion. Alarmingly, the Catalan supply appears to be running out. Rivers such as the Llobregat and Bes�s now barely reach the sea due to water abstraction. Where they do, damming, reforestation and increasing urbanisation upstream all act to reduce sediment input. Marina, breakwater and sea wall developments prevent the natural erosion of the coast and inhibit the transport of sediments in a southerly and south-westerly direction along the shore by coastal currents. The result is the same. 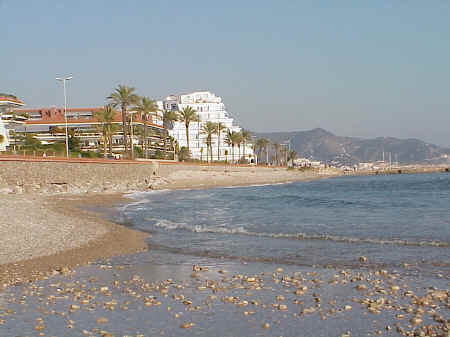 The supply of sand is drying up, witnessed by several resorts including Sitges. The key to the transport of sediment in a south and south-westerly direction along the Catalan coast is the dominant wave direction, mainly from the east (charts 1 and 2). This dominant easterly wave direction is linked to the distance of open sea over which the wind can generate waves, (called the fetch). The longest stretch of unbroken sea facing the Catalan coastline lies some 500 kilometres to the east and south east (see map 1). This has been long-recognised by coastal engineers, and many sea defences are aligned approximately north-south to protect against storm waves from the east. The arrival of wave fronts on the coastline at an oblique angle leads to sediment being carried up the beach at an angle approximately perpendicular to the wave crest, but gravity will cause the material and the backwash to take the steepest gradient seawards which in an oblique wave will be a different course from that taken by the swash. Consequently, material may be seen to drift south and south-westwards along the Catalan coast, a process called longshore drift. (See diagram 1 ). 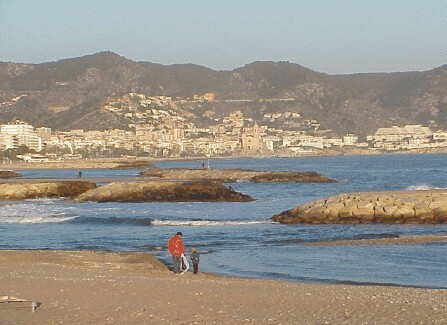 The interruption of the supply of new sediment carried by longshore drift has been one of the factors leading to the loss of sand from the beaches at Sitges. 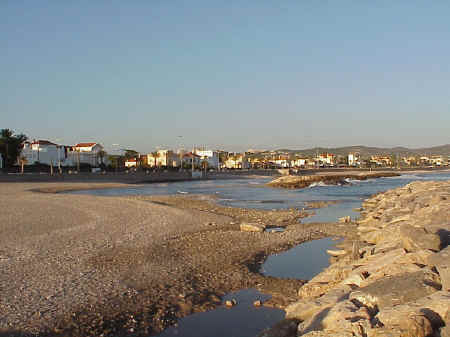 The construction of the Aiguadol� marina updrift in the late 1970s blocked sediment transfer to the main beaches in the south west. 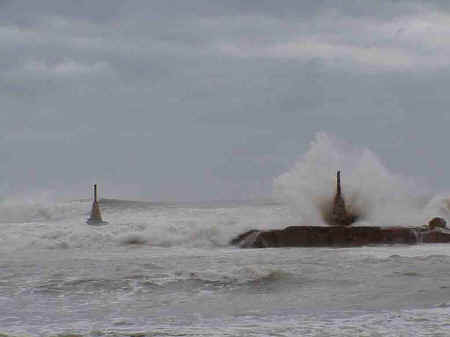 Hard engineering schemes involving a number of breakwaters and eight rock islets were then constructed to help protect and build beaches between Punta de la Torreta and Punta de les Anquines. (See map). However, the loss of sand is continuing, with the alarming total losses on some beaches (see table 1), particularly from those beaches aligned south-east or lying within bays protected by the islets. The data shows a general decline to the south-west in beach width, probably linked to the impact of the marina and breakwaters in preventing the movement of sediment by longshore drift. The beaches which have suffered least erosion (la Fragata, Anquines) are those protected by optimum breakwater alignment to the easterly waves. The beaches most seriously affected by erosion, (10, 12 and 13) are those within bays protected by the rock islets. Photo 3: The effect of the rock islets: a negative one? The rock islets absorb wave energy but interfere with the pattern of waves as they enter the bays. The waves refract round the islets, (see diagram 2) with wave trains crossing each other in the lee of the island. This would leave some areas within the bays with waves approaching parallel to the shore and others with waves approaching obliquely. Waves breaking at an angle on some areas of the the bays would thus lead to the removal of sediment by longshore drift (photo 3). There are three projects proposed by the Sitges authorities aimed at solving this problem of sand loss. They all involve the import of sand from up-drift, from a coastal zone between Premi� and Vilassar and the replenishment of the beaches between the breakwaters of La Frageta and Les Aquines. The eight artificial islands would also be eliminated. The most expensive option is costed at 551 million ptas. Alternative proposals include changing the orientation of some breakwaters (Manel Carbonell), constructing submerged breakwaters (Llu�s del Cerro) or beach replenishment from sea bed dredging (Oriol Pascual). 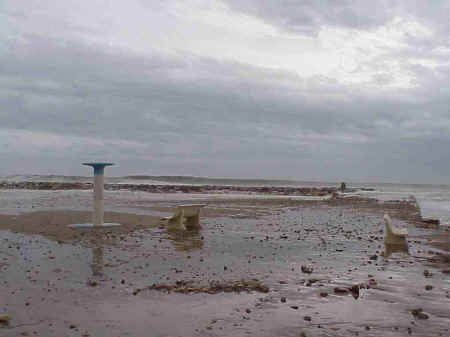 While the Sitges authorities anxiously await a decision on their proposals, Barcelona is planning the immediate construction of semi-submerged breakwaters off the beaches of Bogatell and Mar Bella, those most damaged in the recent storms. The costs are estimated at 525 and 375 million ptas respectively. The need for urgency in restoring these beaches is because of their great tourist value, a position taken by the Environment Minister, Jaume Matas. Hard engineering schemes may be the only short-term solution to the loss of Catalan beaches, but they have a history of unexpected effects and may have huge consequences to the areas down the coast. The consequences of beach replenishment are equally uncertain. The grain size of the sediment is critical in affecting beach permeability and the absorption of wave energy, as the Weymouth, U.K. authorities discovered in 1996. A replenished beach protecting the Preston coast road was transformed from relatively permeable to relatively impermeable due to the smaller grain size of the imported material. The result? Waves simply ran up the beach on to the road. Perhaps the best solution, at least for the present, is a shoreline management plan for the whole Catalan coast. This would offer a strategic approach to shoreline management and attempt to co-ordinate activities between coastal authorities and address the conflicts between competing interests. The long-term approach may be to rethink the intense development of the coastline, and work with the natural processes rather than against them. It may be unrealistic, however to hope for the return of the salt marshes to the Maresme!